Several things that go wrong and confuse people on the first R session (this was going to be a top ten list but I ran out of ideas). I've been stumped for quite a while trying to decide what the criteria really are for when one should use AIC vs BIC. Burnham and Anderson talk about it quite a bit, but they are such staunch AIC partisans that it took me a while to come around to their point of view. The main reason that I would have preferred BIC is that, if you look at the derivations, BIC approximates the log of the marginal likelihood for a large dataset with an uninformative prior, while AIC approximates the same thing — but with a very strong prior (see p. 212-213 of the book, or Kass and Raftery 1995). From this point of view, the BIC seems more sensible. 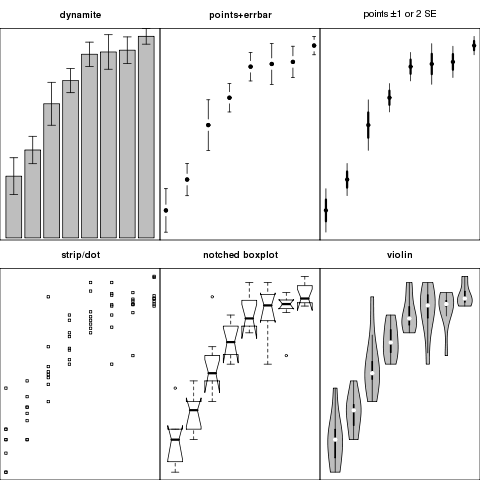 we suggest that literate ecologists at a minimum should master core statistical concepts, including probability and likelihood, principles of data visualization and reduction, fundamentals of sampling and experimental design, the difference between design-based and model-based inference, model formulation and construction, and basic programming. Because mathematics is the language of statistics, familiarity with essential mathematical tools – matrix algebra and especially calculus – is a must and will facilitate collaborations between ecologists and statisticians. Maybe I'll post more here if they would like. 1. Mazerolle, Marc J. 2006. Improving data analysis in herpetology: using Akaike's Information Criterion (AIC) to assess the strength of biological hypotheses. Amphibia-Reptilia 27 (March): 169-180. doi:doi:10.1163/156853806777239922. 2. Anderson, David Raymond. 2008. Model Based Inference in the Life Sciences: A Primer on Evidence. Springer. http://www.springer.com/life+sci/ecology/book/978-0-387-74073-7.